Where Is It: The Park is on the east side of Tucson, just a few miles away. Established by Herbert Hoover’s Presidential Proclamation in 1933, Saguaro became the first U.S. national park or monument set aside to protect a species of plant. John F. Kennedy preserved additional lands in the Tucson Mountains through Presidential Proclamation in 1961. President Lyndon Johnson established the National Wilderness Preservation System by signing the Wilderness Act of 1964; Congress then legislatively mandated the preservation of wilderness values at Saguaro in 1976 by formally designating 71,400 acres as wilderness lands. On October 14, 1994 President Bill Clinton signed legislation enlarging Saguaro’s boundaries, and making Saguaro National Monument America’s 52nd national park. # Visitors: 678,271 in 2013. October had the least attendance; March had peak attendance. Saguaro National Park is located within a desert, but contrary to what you might expect, there is an abundance of life. Plants here are adapted to drought, so during long dry periods they are able to go dormant, conserving their water. At these times, many plants appear lifeless, but shortly after a rainfall these plants are able to come to life sprouting new green leaves. If you like green, you will especially enjoy Saguaro National Park during the rainy seasons. The Rincon Mountain District of Saguaro National Park ranges from an elevation of 2,670 ft to 8,666 ft and contains 6 biotic communities. The biotic communities (starting from the lowest elevation) include desert scrub, desert grassland, oak woodland, pine-oak woodland, pine forest and mixed conifer forest. Average annual precipitation is approximately 12.30 in. The Rincon Mountains peak at a considerably higher elevation than the Tucson Mountains, therefore there are more biotic communities and increased plant and wildlife diversity. Because of the higher elevation in the Rincons, animals like the black bear, Mexican spotted owl, Arizona mountain king snake, and white-tailed deer live in this district. Fees: A weekly vehicle pass is $10. Staying There: There is no walk-in camping in the Park. Back country camping is available by permit. 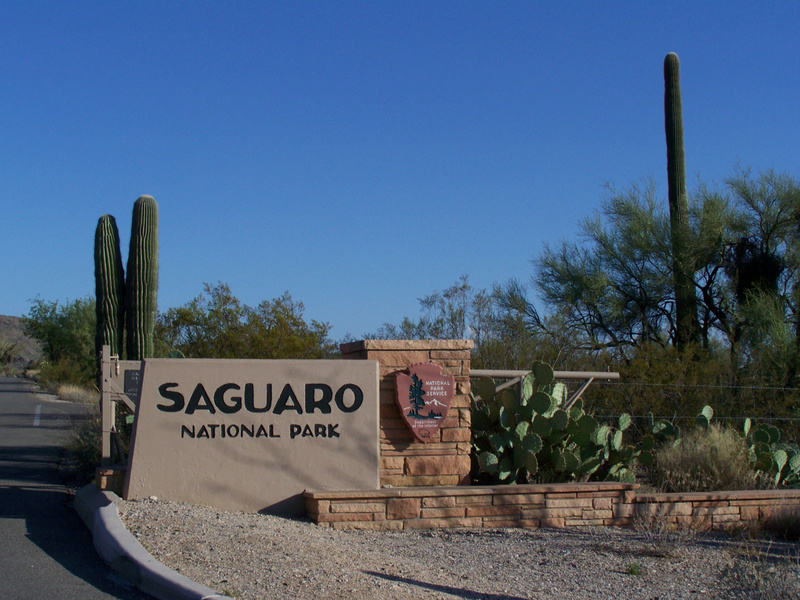 While a proposed highway corridor through the Avra Valley of southern Arizona would not go through Saguaro National Park, it would nevertheless adversely impact the park, according to the Friends of Saguaro Board of Directors. Without a single dissenting vote, the non-profit group’s board recently approved a resolution expressing its opposition to the construction of a suggested “Interstate 11” corridor route through the Avra Valley. The resolution noted the suggested route would “negatively impact thousands of acres of public lands” and “sever critical wildlife movement corridors,” as well as devastate the park’s scenic viewsheds. The board also noted that an interstate highway through the Avra Valley would increase air pollution in a national park that is afforded additional federal protections by The Wilderness Act of 1964. Year-round. From October through April, temperatures reach the upper 60s to mid-70s and can drop below freezing overnight. From May through September, highs routinely exceed 100°F. July through September is characterized by brief, fierce thunderstorms. Saguaros bloom nightly from late April into June. Black Phoebe. From the Park’s Facebook page. The Pyrrhuloxia or Desert Cardinal (Cardinalis sinuatus). From the Park’s Facebook page. Tweeted by the US Department of the Interior, 2/12/14. Katydid nymph. From the Park’s Facebook page. From the Park’s Facebook system. Cactus wren, the state bird of Arizona. From the Park’s Facebook page. Photo courtesy of Terra Galleria. www.terragalleria.com. JasonsTravels.com: A Sonoran Desert Hike…. « You. Must. Go. Here.